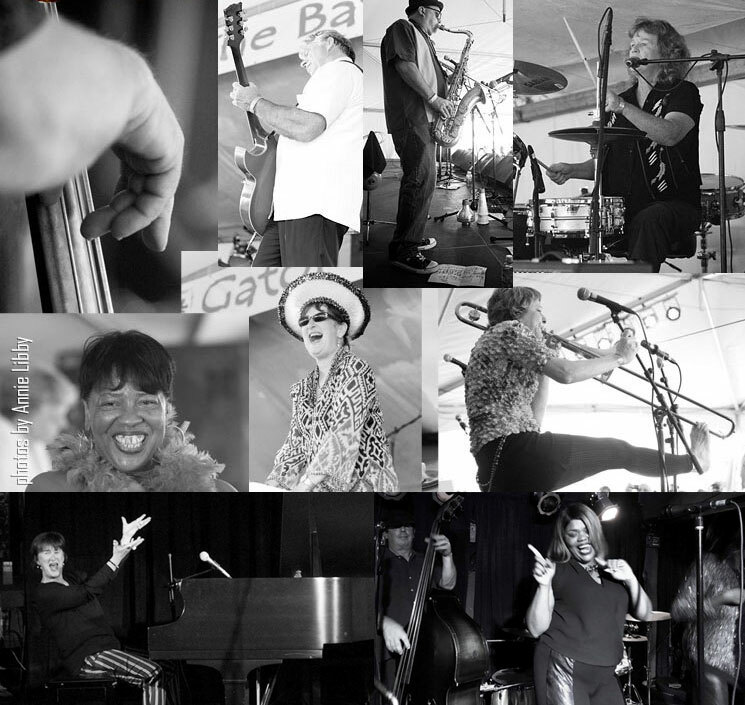 Download the Electronic Press Kit (EPK) for Sue Palmer&Her Motel Swing Orchestra. Perhaps one of our best shows is our Mardi Gras show. We have been a fixture at the great San Diego festival, Gator By the Bay for over 10 years. This festival is the closest we ever get to the New Orleans celebrations, in San Diego. We can celebrate Carnival Time with the best of them!!! Sue has appeared in numerous solo Boogie shows, including several appearances at Berkeley, California's Freight&Salvadge, Dizzy's in San Diego, with the late Hadda Brooks (well known Queen of Boogie in the '40's and '50's), and the San Diego Art Museum. 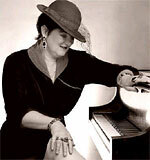 Sue's also played at Yoshi's in Oakland, the Arches Piano Stage in Cinncinnatti, the WCHandy Festival in Alabama, and Silvan Zingg's Boogie Woogie Show in Switzerland. Boogie woogie aficiondos rave about Sue. See the News Section of the website. right: 4 Queens of Boogie Woogie: Doña Oxford, Wendy Dewitt, Lisa Otey and Sue at Dizzy's, February 26th, 2010. Photos by Hiro Izeki. While most of Sue's repertoire falls around 1947, a little before and after WWII, some of them are more recognizable than others. In the years following the 2nd World War, the nitch between jazz and blues, presursors of rock and roll, was being filled by small piano combos fronted by female singers. These were performers who mixed boogie woogie, swing, ballads, and blues with sly, suggestive lyrics. All girl vocal groups were being disbanded, big bands were becoming too costly to maintain, and television was beginning to compete with every kind of entertainment. Stars such as Hadda Brooks, Nellie Lutcher, Julia Lee, and Camille Howard came to the forefront. The Sue Palmer Quartet, with Deejha Marie on vocals and Sue tearing up the 88s, captures this style perfectly. Sue can also provide a small intimate, jazzy, smaller group. Calling themselves "Madame Palmer&Les Pommes Frites," Sue plays the classic Edith Piaf number La Vie En Rose, Cole Porter's I Love Paris, and Sidney Bechet's Petite Fleur, among others. Dressing in berets and black skirts, Sue and her trio can flavor a room immediately. including "Some Like It Hot" outfits and songs. replete with flapper dresses and spats. Sue Palmer&Her Motel Swing Orchestra pair up with the wonderful doo wop/a capella group "Pieces." Deejha Marie (Sue's lead singer), and her 2 cohorts sing Ray Charles hits like they should be sung. Between Sue's piano and Jonny Viau's fat tenor sax sound, Ray is up there smiling down.